PARIS, April 12. /TASS/. 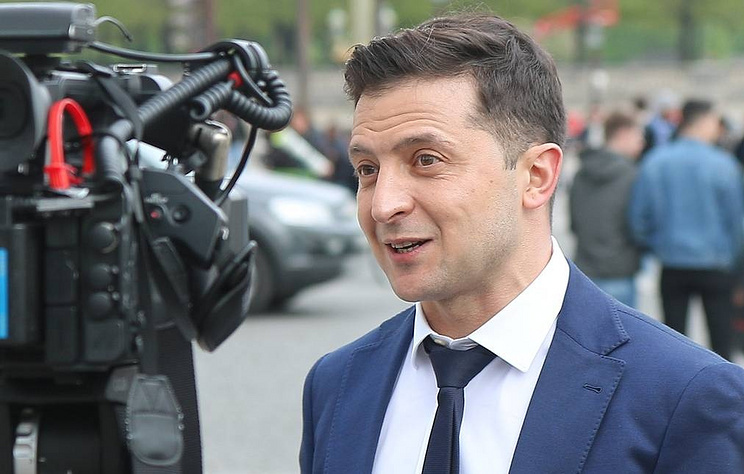 Ukrainian presidential candidate Vladimir Zelensky’s talks with French President Emmanuel Macron were meaningful, Zelensky told TASS after his meeting with Macron in the Elysee Palace on Friday. “Yes, we have held very constructive talks,” he said when asked about the atmosphere of the meeting. However, Zelensky did not elaborate. The Ukrainian presidential front-runner arrived at the Elysee Palace at 3.10 p.m. and left it approximately an hour later. Earlier, the Elysee Palace press service confirmed to TASS that Macron would meet with his Ukrainian counterpart Pyotr Poroshenko at 6.00 p.m. on Friday, adding that prior to that meeting, Macron would hold talks with Poroshenko’s opponent, Vladimir Zelensky. The spokesperson did not elaborate what issues would be on the table of the talks, but pointed out that bilateral issues were expected to be touched upon along with cooperation within the framework of the Normandy Four group. Hey Buddy!, I found this information for you: "Ukraine’s presidential hopeful Zelensky hails talks with Macron". Here is the website link: https://russophile.org/ukraines-presidential-hopeful-zelensky-hails-talks-with-macron/. Thank you.